This one's dedicated to some of my friends from where I used to work. It appears that outdoor living may soon be upon us. It was at least 16°C outside yesterday under overcast skies. If the sun had been fully out who knows how warm it would have become. Today is rain – the kind of rain you just know is going to make the grass grow. In two weeks maximum we'll probably be mowing, if some people haven't been already. This is just before the sauce is puréed. But the sure turn in the weather is a sign that we had better prepare for what is to come. That means weekend beers, drinks and BBQs on the deck. It falls to me to test-drive BBQ recipes so you'll be well-armed when your turn to host outdoor fun comes. One of the easiest things you can do is make your own BBQ sauce. Really, I'm serious. It can be a little bit splatter-y on the stove if you're not careful, but some flavours you just can't buy. Like Mexican BBQ sauce. I find most commercial BBQ sauces highly unsatisfying. That's why I make my own. This one's packed full of south-of-the-border flavours: garlic, jalapeno, lime, chipotle and cumin. It only takes about 20 minutes to make too. There's a little bit of a secret for tender ribs. 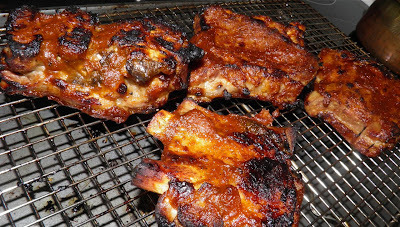 Boil your ribs in 100% juice before placing them on the grill. This little gem came from a work friend of my spouse. I call it the "Spryfield method." Grilling or roasting the corn in the husk gives it a nice, light smokey flavour. Pre-soaking lets you get some additional moisture between the leaves if the corn has been shipped from a long distance. Completely fresh from the farm corn won't need soaking. I hope you try this recipe. It may seem a bit long, but everything's there for a reason. And the end result is well worth the minimal effort. sauce on the ribs will burn easily. Cut each rib into 3 equal pieces. 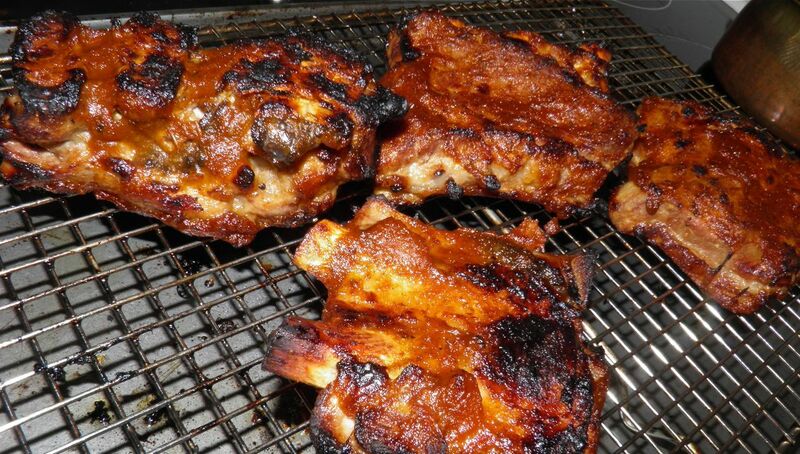 Boil the ribs for 1 hour in pineapple juice. Prepare the corn butter by mashing together the 1/4 cup of butter with 2-3 tbsp of chopped cilantro. Set aside in a small bowl. 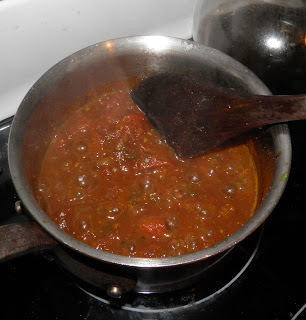 To make the sauce, soften the onion, garlic and jalapeno in the oil. Add 1 tbsp chopped cilantro, tomatoes, vinegar, lime juice, brown sugar, Worcestershire sauce, chipotle powder, cumin and liquid smoke. Bring to a simmer and let cook for 5-6 minutes. Purée the mixture and then return to the pot. Let cook for a further 5-10 minutes until thickened. Taste for spiciness and sweetness. Adjust both if desired. Two methods are listed here – BBQ or oven roasting. Both take the same amount of time. If grilling, place the corn on an oiled barbecue grate. Grill for 30 minutes turning to brown the corn husk evenly. During the last 10 minutes add the pre-cooked ribs coated with the sauce. Grill until browned. If roasting, place the corn on the middle rack of an oven preheated to 350°F. Roast for 30 minutes, turning once halfway through. 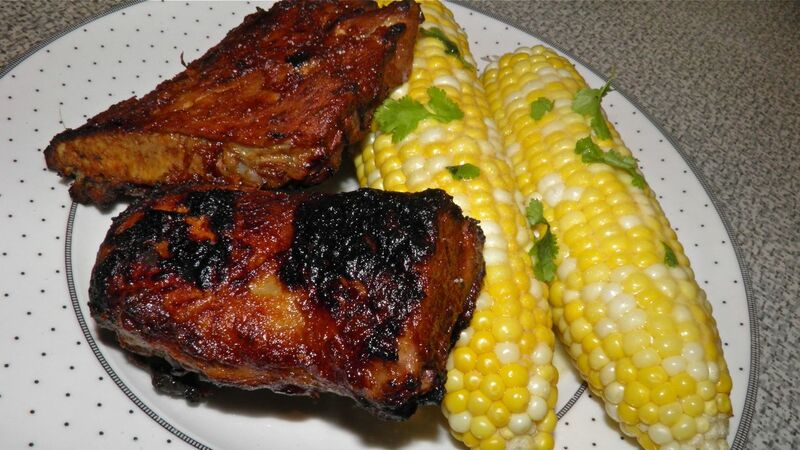 10 minutes before the time is up, place the coated ribs on a rack above the corn and switch the heat to broil. Broil each side of the meat for 5 minutes, or until browned. Remove from the grill and serve. To finish the corn, remove the husk and silk, salt lightly if desired, and serve with the cilantro butter. *The 1 hour time is boiling the ribs. It can be done well before, even up to a day ahead. The sauce can be done days ahead and refrigerated. So theoretically you could pull this off in 30 minutes standing at the BBQ.